This article was posted on 7th June 2016. For the uninitiated the idea of Spring/Summer and Autumn/Winter collections may seem plenty - after all, that covers all your wardrobe needs for every season. But what about pre-season, first-summer, resort, cruise, pre-fall and high summer? Baffled? It's not surprising! We're here to help get your head around the idea that there's something between spring and summer (who knew?!) and showing you what these emerging trends mean for our homes. Presented from May-July (Pre-Summer) and November (Pre-Fall) - they act as a precursor to the traditional collections we see reported on the catwalks during fashion weeks across the globe. The term “cruise” or “resort” came from its origins as a collection of clothing the designer's jet-set clients would select from for their impending luxury cruises or stylish resort holidays. Although world-wide travel and the ease of purchasing fast-fashion has become more prevalent and available to the masses, the pre-collections still remain an important event in the high-end fashion industry's calendar. 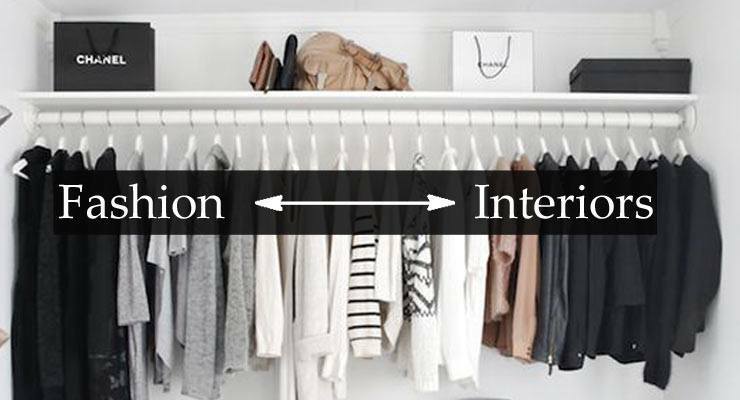 The synergy between the fashion world and the interiors industry is undeniable; the two creative fields often cross paths, with one informing the other and vice-versa. Fashion designers often site architecture and glamorous interiors as a starting point for their collections. 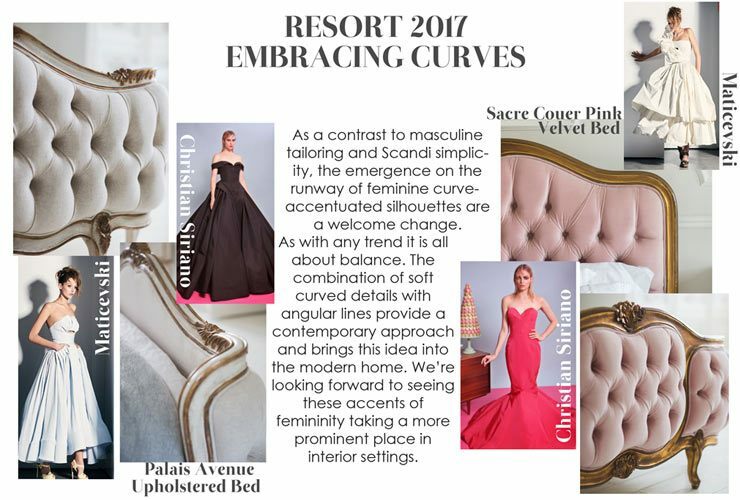 Meanwhile, interior designers, likewise, often look to fashion for color inspiration, popular patterns and textural ideas. White and Gold Palais Bed, Gold and Pink Velvet French Bed. 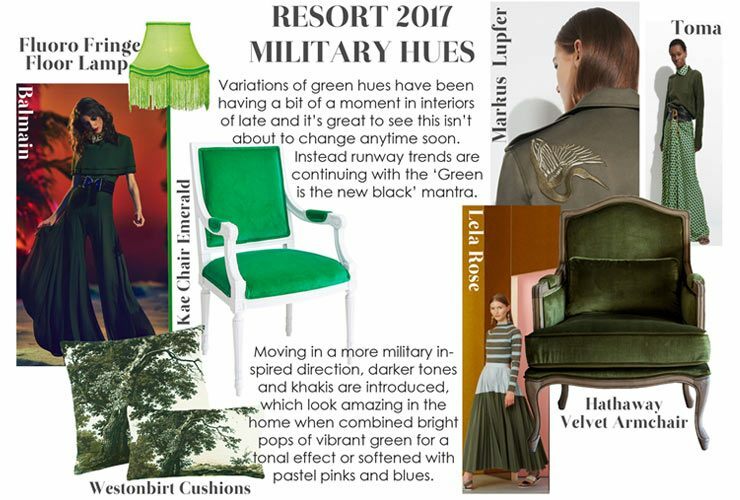 Green Fringe Floor Lamp, Green & White French Chair, Tree Print Cushion and Moss Green Velvet Chair. 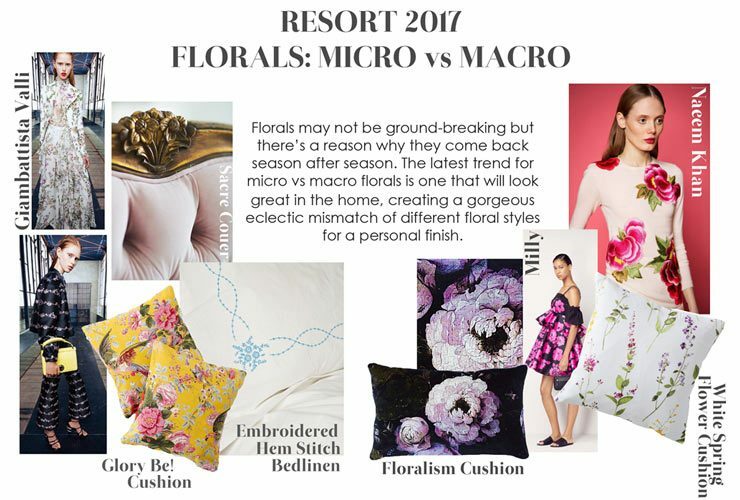 Pink Velvet Upholstered Bed, Yellow Toile Cushions, Blue and White Embroidered Bed Linen, Peony Print Cushion, Light Botanical Print Cushion. 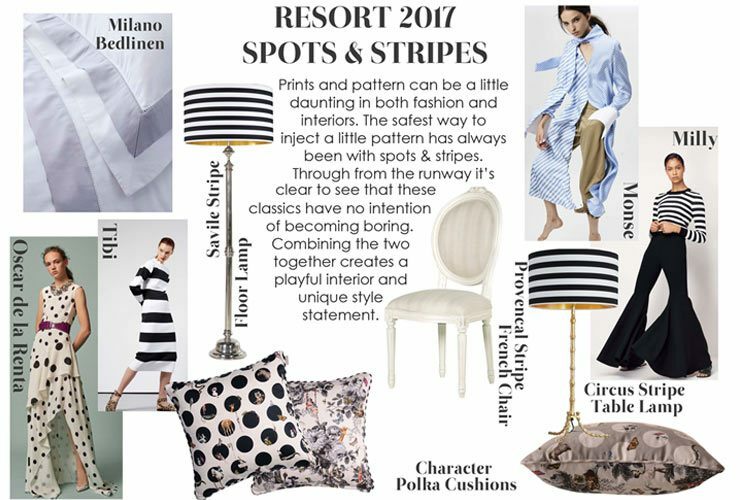 Grey and White Bed Linen, Silver and Monochrome Floor Lamp, Polka Dot Cushion, French Stripe Chair, Gold Bamboo and Striped Shade Lamp. 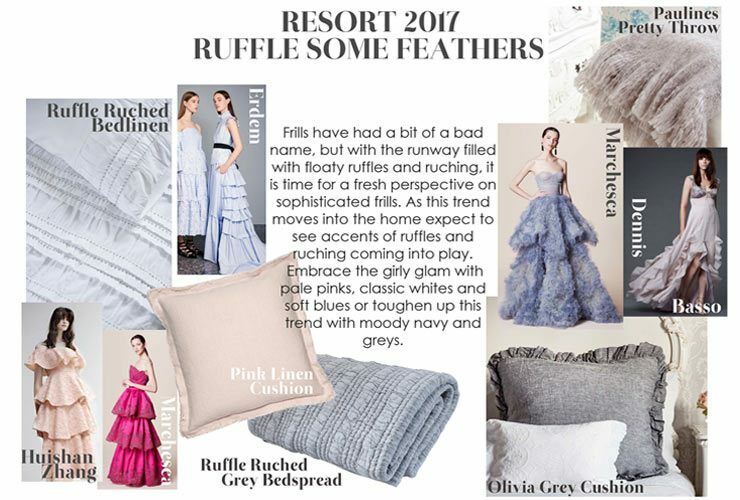 White Ruffle Bed Linen, Pink Linen Cushion, Grey Ruffle Bedspread, Pauline's Throw, Grey Ruffle Cushion.